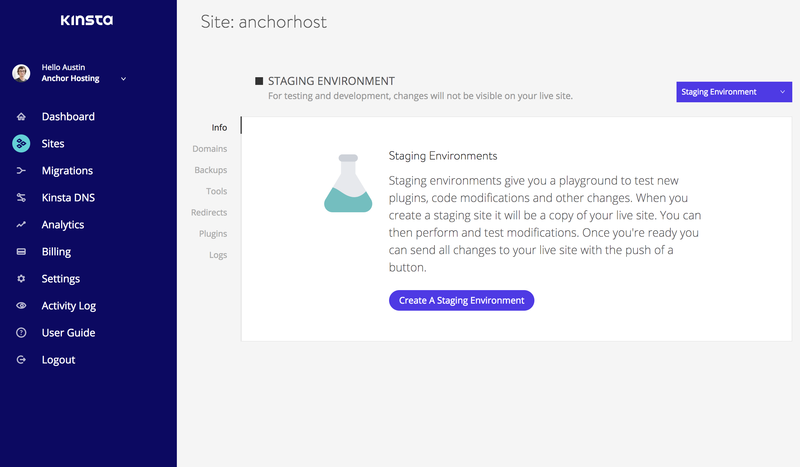 Kinsta, a relatively new managed WordPress web host, has been consistently rolling out new features. While I’ve been impressed with their improvements, their production to staging deployment is a hassle to work with. Luckily this can be resolved with a custom WP-CLI script using WP-CLI over ssh. Within Kinsta’s dashboard there is a button to generate a staging copy of your website, which is based on a snapshot of the current website. While there is a button to push staging back to production, there is not a button to push from production to staging. The only workaround is to create a new production backup snapshot and restore that backup to staging. Using their restore method is painful as it regenerates the staging sftp access info. Once the staging site is created there is no need to recreate. The following script will take a fresh production database snapshot and will incrementally sync over files using Rclone. The following script assumes you added sftp credentials into Rclone for both production and staging sites. ssh $remoteserver_staging "cd public/ && wp search-replace //$domain //staging-$website.kinsta.com --all-tables --skip-plugins --skip-themes"
ssh $remoteserver_staging "cd public/ && wp search-replace //www.$domain //staging-$website.kinsta.com --all-tables --skip-plugins --skip-themes"
ssh $remoteserver_staging "cd public/ && wp option update blog_public 0 --skip-plugins --skip-themes"